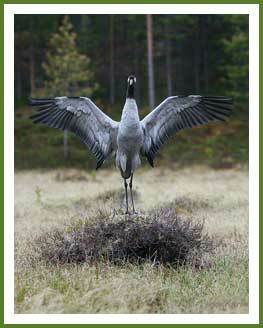 Renttimä the crane thrived two weeks longer at its home bog than during the last year. 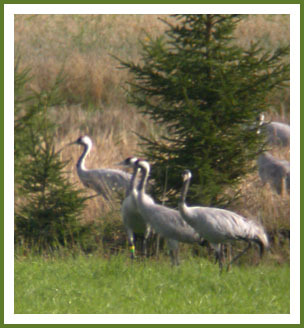 On August 25th 2009 the crane was located staying overnight at Revonsuo-bog 300 SW of the home bog. We will be receiving locations and also updating the progression of Renttimä’s journey, every tenth day in September 2009. 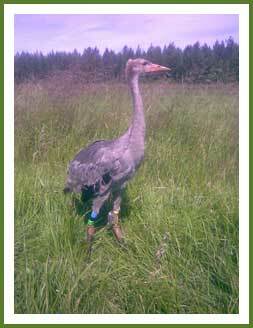 An adult female crane named as ”Inka” was captured by Olli-Pekka Karlin from the northernmost breeding population of the Eurasian crane in the field season of 2009. We want to thank Kari Tikkanen, Juhani Honkola and Esko Sirjola for their great help in the field. 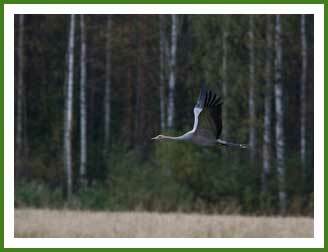 The home range of this female crane involved scattered bogs the area of which was significantly smaller compared to that of the vast bogs a few hundred kilometers south of Ivalo. 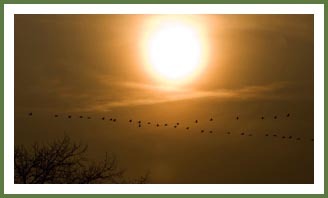 Also in this year the vast majority of the Lapland’s cranes commenced autumn migration during the last week of August. Inka, however, was located nearly a month later at the sewage disposal plant of Ivalo, which is the main assembly area also during spring. Neither Inka nor any other cranes were found and we were thus not able to verify whether she had managed to raise any fledglings. As the two adults from Hattuvaara, Eastern Finland, perished I decided to capture two colts to replace the damage. The brood of two colts was captured together with Jukka Matero and was named after the lake Juka that is the centre of that crane territory. A 20 g leg-mountable unit was attached to the larger one of the two crane colts. The family thrived until September 15th 2009 at their territory. On the September 25th the family had however departed Finland and was located in Western Estonia 520 km WSW of the home lake Juka. As the two adults from Hattuvaara, Eastern Finland, perished I decided to capture two colts to replace the damage. The latest crane colt was captured near Kiihtelysvaara, based on the expertise of the local crane watchers Jukka Matero, Janne Leppänen and Kimmo Koskela. I want to thank them for their great help. 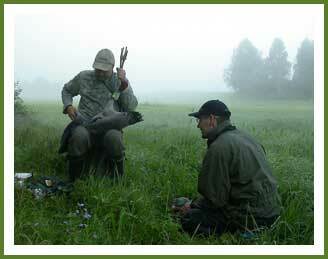 The capture took place very early in the morning in a thick fog, typical for the region. This very “morning fog” is called “upetto” in eastern Finnish dialect. The crane was consequently named after fog as “Upetto”. He was the larger of the two colts and weighed already 4 kg. Upetto was seen a number of times together with his family during the autumn and it was wonderful to observe him growing a strong adolescent. 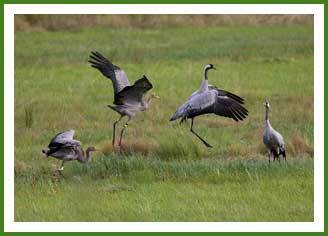 In the last week of September, the family occasionally joined the crane flocks of Valkeasuo-bog assembly area but used to return to the home daily. She is the empress of the mound and the queen of the bog. It is Inka’s pleasant responsibility to produce new members to the northernmost breeding population of the Eurasian crane. 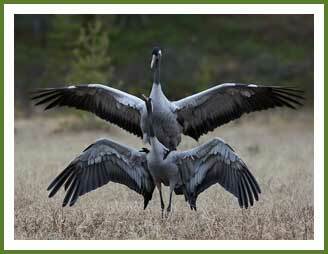 A crane colt ”Juka” is released after the deployment of the PTT unit. The unit has just been attached to Upetto by Petri Suorsa. Janne Leppänen inspects carefully. Upetto is already a strong flier. Upetto and his family dancing gracefully on September 15th 2009. Cranes of Jelas Polje 1. 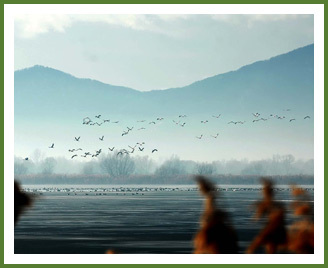 Cranes of Jelas Polje 2. 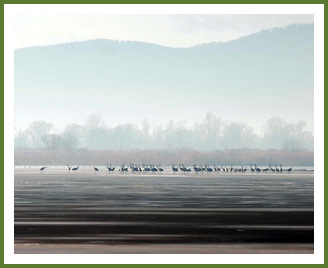 A flock of cranes arrives to stay overnight at Jelas Polje fish ponds, Croatia on February 15th 2010. 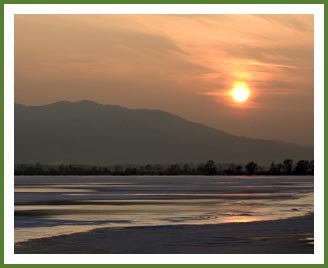 The night roost of cranes at Jelas Polje, Croatia on February 15th 2010. 11.9.2011 Jukka Matero photographed in Sikosuo, Tohmajärvi, Finland a crane that had dropped color band/bands off the left tibia. 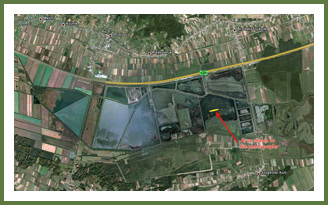 It is most likely that this crane is "Upetto" that was tracked to Ukraine in 2009.